Lovely, Strong, And Thoroughly Interesting Cast Of Female Characters - Kate Says: "Reading Is Fun!" 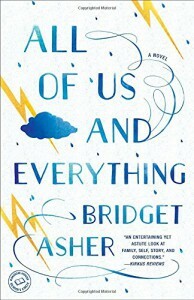 This was my first book by Bridget Asher I have ever read, but it won't be my last. Let me explain. The writing was funny, heartfelt, and just plain lovely. I mean we all come from interesting beginnings, don't we? Asher's lens is wonderful. She created some very interesting characters in the Rockwell Sisters: Esme, Liv, and Ru, and their mother Augusta, was wonderfully fascinating as well. I also enjoyed the themes Asher explores: of deep familial ties and how they can sometimes bind and gag us, until we are willing to peel back the layers and explore the (dis)connections, reconcile, and forgive ourselves and each other, so that deep, meaningful, and extraordinary changes can take place inside ourselves and within each other. This has also been the theme of my year, on a personal level, so I could really relate to this book. It made me laugh out loud, cry, and go deep inside myself to heal those old wounds that I don't want to fester and carry around with me any more, on all levels of being, especially at the emotional level. I recommend this book for book clubs, and if you enjoy the writing styles of Nick Hornby and Kevin Wilson.